Soon Koh and Leong speaking to reporters at their house today. 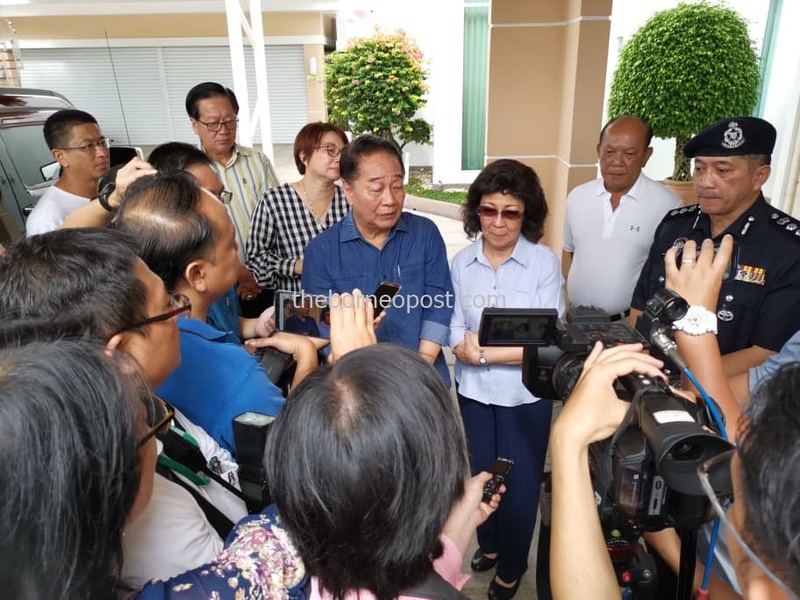 SIBU: Datin Seri Pauline Leong, wife of Second Finance Minister Dato Sri Wong Soon Koh said she had found her son Dato Andrew Wong unconscious in the dressing room of their house at around 9pm yesterday. Leong said she called in a doctor to resuscitate Andrew, but, failed. “Andrew was then taken to a medical centre, where he was pronounced dead at 11pm,” she said. Both Soon Koh and Leong met reporters at their residence this morning. “Andrew lived a full life; he lived as a dignified person,” Soon Koh said. He said Andrew had left their house at 7am yesterday for jet skiing in Tutus, a two-hour boat ride from Sibu. Soon Koh said when his son did not come down, his wife went to check on him and found Andrew lying on the floor unconscious. Soon Koh described his only son Andrew as brilliant and had plans to develop Sibu. He said Andrew had engaged experts for the job and had the blueprint ready. He said his son had also engaged consultant to study the traffic jam in Sibu for solutions in six areas. “At that time, he did not have the platform to carry out the plan. He said he would wait for a proper platform. Soon Koh said Andrew’s position as Sibu Municipal Council deputy chairman was also cut short, and it was therefore not right for him to pursue it. He said Andrew also had a passion in helping the rural folk. Now that his son had passed away, Soon Koh said he and his wife would remain strong, as life goes on. Meanwhile, Leong described his son as a kind-hearted and warm person, but, at times, he was misunderstood. Despite the demise of his son, Soon Koh said he would continue to play his role to help Sibu.